ORDER NOW USING GREEN BUTTONS! PAPERBACK: Employment Options: The Ultimate Resource for Job Seekers with Disabilities and other Challenges Have you been down-sized, fired, finished your military service or been ill? Do you have a physical, mental or emotional disability? Overqualified? Under-qualified? This book can help you find suitable work and get hired. This workbook uses pictures and easy-to-complete activities that our clients use over and over again. By increasing self-awareness, self-esteem and self-advocacy, the workbook uses sound rehabilitation practices to get career seekers with disabilities back to work and keep them at work. 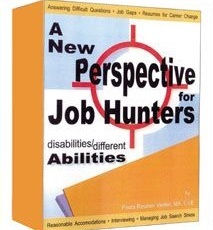 This book clearly addresses the concerns and fears of job seekers with disabilities with extra emphasis on what questions are illegal and how to answer them. The low reading level makes it appropriate for most job hunters. 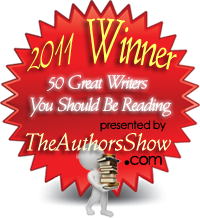 Motivational and career coaching strategies are incorporated throughout the book. This companion Instructor’s Guide is a great resource on how to use the workbook with your job hunter. Step-by-step instructions facilitate the use of the client workbook with groups and individuals including exercises that improve assessment skills; reducing the amount of time it takes to get back to work, as well as unnecessary retraining costs. This offers new counselors, recruiters and employment agencies the tools they need to quickly identify suitable job goals for those with challenges. The job placement and counseling tips make it easier to get positive results with even the most difficult populations. Complete with a unique index of alternative jobs for persons with lifting and other restrictions. 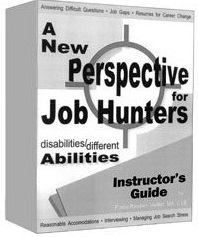 The Instructor’s Starter Kit: A New Perspective for Job Hunters with Disabilities and Other Challenges [20 Workbooks & 1 Instructor’s Guide] by Paula Reuben Vieillet, MA, CVE (Paperback) This Starter Kit is perfect for the Instructor that wants to train others on how to pre-screen and place your applicants. Perfect for group training.